We will prepare a round cake for fondant application and cover the cake with rolled fondant. 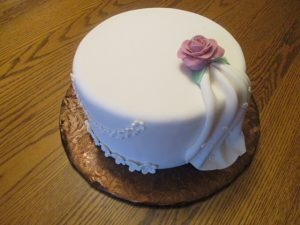 We will then learn a few basic fondant decorating techniques, such as: draping, plunger cutter flowers, and a super-fast / super-easy fondant rose. ← Why can’t you return food products?? ?